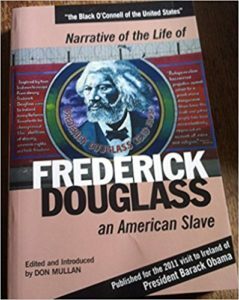 In 2011, in advance of the visit to Ireland of the USA’s first African-American President, Barack Obama, Don Mullan re-published the Narrative of the Life of Frederick Douglass – an American Slave to mark the historic occasion, in both softback and as a limited edition hardback. The foreword to this edition was written by the President of Ireland, Her Excellency, Mary McAleese, with an epilogue by the Chief Executive of Concern Worldwide, Tom Arnold. Mullan’s introduction charts key correspondence between Douglass and the head of the American Abolitionist Movement, William Lloyd Garrison, following his encounter with O’Connell one evening in September 1845. Mullan demonstrates how Douglass’s thinking was influenced by O’Connell’s address that fateful evening. He argues that the greatest gift Ireland gave to Douglass wasn’t simply welcoming him as an equal human being, but the fact that having arrived as a single issue campaigner, Douglass departed a determined internationalist. For the rest of his life, Douglass fought, not just for the ending of slavery in America, but, like O’Connell and Ireland, for the oppressed worldwide. Mullan’s 2011 edition of the Douglass Narrative was awarded a 2012 Nautilus Book Awards Silver Medal. Mullan’s introduction to the edition may be accessed by clicking here.